The ITIL Intermediate Qualification : Service Operation is part of the ITIL Intermediate lifecycle stream and one of the modules that leads to ITIL Expert in IT Service Management Certificate. Innate Labs has been a preferred knowledge service provider to leading MNCs and corporates across india and has been consistently adding value to these organizations through value based qualification certifications including ITIL, PRINCE2, PMP, SixSigma. The Information Technology Infrastructure Library (ITIL®) is the set of best practices in the ITSM (IT Services Management). It is implicit that an individual must go through officially accredited ITIL trainings and ITIL certifications’ programs/courses provided by an Accredited Training Organization. 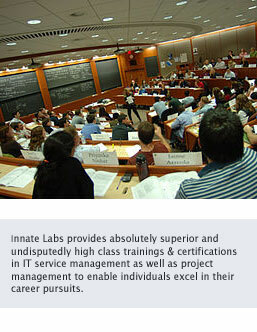 Innate Labs is an accredited training organization (A.T.O.) accredited by APMG – ITIL’s official accreditor. Certification without knowledge can lend someone to an interview call but cannot help someone to get a job or grow in their career path. Knowledge is the core and certification is just a proof of your knowledge. Our trainers are ITIL Experts and are accredited with APMG-UK for conducting the training and certification workshops. The trainers are experienced and seasoned professionals from the IT industry who have 15+ years of practical experience working in all the phases of service lifecycle (i.e. service strategy, design, transition, operations and CSI) and have played several roles in the service management role ladder. It is this experience that enables our delegates to gain the right practical knowledge coupled with the best practice standards helping them to achieve their career aspirations in our 2-day training and certification sessions. In this course, you learn how to plan, execute, manage and optimise the service operation processes. Through personalized coaching, practical assignments, real life case studies, practice (mock) exams and extensive review sessions, you not only gain the requisite knowledge to take the ITIL Intermediate Qualification: Service Operation Certification Exam but also gain detailed insights in the service operation guidance as provided by the ITIL Framework. The ITIL 2011 service operation syllabus has contextual as well as minor changes to the coverage required for each syllabus section and certain specific minor changes to the recommended contact hours for each section. There are absolutely no changes to the processes and functions included in the syllabus or to the common service operation activities as part of the ITIL Service Operation best practice guidance. What are the changes being made to ITIL Service Operation : Best Practice Guidance book for ITIL 2011 Edition? The Process flows have been modified/revised or newly added for all processes including request fulfillment, access management and event management. key principles, including guidance around service requests and request models, and proactive problem management, have been better explained than earlier version. The publication has been revised to clarify how fundamental events flow into filters and rule engines to produce meaningful event information. The relationship between application management activities and application development activities is also explained. Other explanations/revisions include an expanded section on problem analysis techniques, coverage of procedure flow for incident matching, and further guidance for escalating incidents to problem management. Addition to this, the best practice guidelines for managing physical facilities (e.g. Data Center) has been clarified and detailed. The Lifecycle stream-which includes the service peration qualification-consists of five modules or certifications. These certifications focus on the service lifecycle, the use of process and practice within the lifecycle and developing the skills needed to deliver quality service management practices in an organisation.